A versatile voice actor with a youthful sound specializing in first-person narrative story telling. but then everything goes downhill? No? 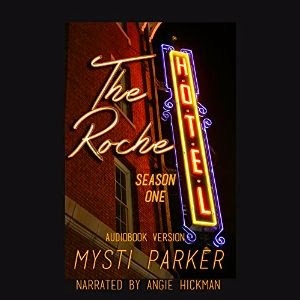 Then check out this quick listen from Mysti Parker for a few good laughs! Available from Amazon, iTunes, and Audible. Imagine waking on a deserted island with no memory of who you are. Imagine learning early that sunlight burns you, you have a thirst for blood, and the only blood available to you is from the small rodents that inhabit the island. Imagine that humans visit your island, but only in daylight when you must hide in your cave . . . and they smell -- so -- delicious and you are so -- very -- hungry. Week after week, what you most crave is *just* out of reach. Then, one night, the boat that brings the humans doesn't leave before dark . . . If you never thought vampires could evoke your sympathy, you must give a listen to this novella by Miranda Hardy and Ainsley Shay, published by Quixotic Publishing. Now available from Audible, Amazon and iTunes. For weeks the plan of Jennifer Benton and her friends was to go Texas and take refuge on a ranch owned by Mark's family. The group doesn't know if the house is still standing, if it has been overrun by zombies, or if other people have taken refuge there. What if, after all they've gone through to get there, they find that their safe house . . . isn't? Volume Two of Jolie du Pre's zombie series is now available from Audible, Amazon, and iTunes. Sometimes, for editing and QC reading and mastering files, I leave my little box of a studio. This allows me to get some sunshine and oxygen and to socialize with my family and our cats. Some parts of the mastering process involve a *lot* of waiting for the computer to do its thing. One could stare at the computer and get very, very bored; or one could wander off and take care of household chores and risk losing track of where one is in a particular file's progress; or one can sit right there and knit a soon-to-be-due Christmas gift. Shown are my laptop, my headphones, my water bottle, and my project checklist, along with my knitting project, and Chuck. Not shown are my audio interface (it's there, just behind the monitor), the audiobook I'm listening to, and the bread rising in the oven. Some experts say that multi-tasking doesn't work -- but when waaaaaaaiting for something else (like the bread or the computer) to do a thing, we can do another thing. Ever wonder what, exactly, your Prepping neighbor was prepping for? Do you think YOU are ready? You have a stockpile of potable water, but how much can you carry with you if you have to escape your home? You have a firearm at the ready, but, in the heat of the moment, would you be able to use it effectively? You know there is a relative safety in numbers, but what if you trust the wrong people? Meet author Jolie Du Pre's resilient heroine, Jennifer Benton; we none of us know how strong we can be until we are truly tested. Available from , Audible, and Amazon . If it meant sparing those you care about most from unspeakable grief, as well as a better life for yourself, would you (could you) live the ultimate lie? Redefining success, coping with a grief that cannot be shared, discovering that relationships are not always what they seem, and untangling oneself when a lie of omission becomes a massive tangled web . . . Amy Shiley can have no concept of how an in-the-moment decision will affect everyone and everything she touches from that day forward. What would you do if your marriage were over? What would you do if you awakened to find yourself in your 17-year-old body, in your old room in your parents' house? And what would you do if you then found yourself in an unfamiliar high school, in class with the teen-aged boy that would become who had been your husband? Would you think you were dreaming? Would you be able to relish this second chance at a good relationship, or would you worry about what your "real-life" husband and daughter were doing, and how they were coping, while you were stuck in the past? Author Brandy Jeffus Corona has written the very sweet (and occasionally steamy) story of Teegan and Jax. While the book is told mostly from Teegan's point of view, we do occasionally get to see what's going on inside teen Jax's head. Wait until you find out what his dreams are about; and the ending may surprise you, too.